Home Costs > How Much Does Carpet Cost? Carpet installation is usually one of the first things people do when buying a new home. It is also something that normally needs to be done every 10-15 years, depending on the quality of the existing carpet. Because of the wide range of carpet options, the price can vary greatly. Carpet comes in a variety of styles, such as loose texture, tightly looped, patterned, or Frieze. Carpet also comes in a variety of fabrics including wool and nylon. Some of these carpets are specifically designed to be more durable while others are designed to be cheaper. Carpet costs can range in price from $2 per square foot to more than $10 per square foot, depending on the type, brand, where it’s purchased and quality of the carpet. Some stores include padding in their advertised prices while others charge separately. Padding that is not included can cost anywhere from $2 to $6 per square yard (9 square feet). The thicker the padding, the longer the carpet will last and the softer the floor will be. However, the thicker the padding the higher the price. Most store prices include the installation of the carpet you purchase, but other stores may advertise lower prices and charge extra for installation. If the installation is not included, it can cost anywhere from $2 to $5 per square yard. This price is probably the one that will vary the most from company to company. Some companies charge a fee to get rid of your existing carpet while others include this in the price. This fee is usually between $1 to $2 per square yard. According to the CarpetProfessor.com, you should plan on spending anywhere from $1.66 per square foot for carpet that will last five years to as much as $5 per square foot for a heavy traffic carpet that lasts more than 20 years. The carpet and padding will normally be included in the advertised price. The installation of this padding and carpet is usually included in your final price. The removal of your old carpet and padding is usually included in the advertised price as well but can be an additional charge in some cases. What are the extra costs to be aware of? Some companies charge extra for the initial measurement of your room to see how much carpet is needed. Other companies include this home-visit for free, while others do not do this at all. Some carpets are treated in order to avoid staining. This stain treatment is usually an extra cost. Some carpets are made out of recycled materials and may cost more per square yard. If a room is a unique shape and will use more carpet cuts than normal, it will probably be more expensive. If there are stairs included in the area being carpeted, there will be an extra charge. Many companies will charge extra if there is furniture that needs to be moved. While some companies provide a cheaper pad, this tends to be on the thin side. If you want to upgrade to a premium carpet pad, it can cost upwards of $1 to $2 per square foot. If the subfloor is weak, a contractor may recommend replacing the subfloor before installing the carpet. This can cost an additional $50 to $75 per hour. While optional, molding may be added after the carpet is installed. Gather three to five samples from your local carpet store to compare to the colors in your home. This is a great way to see if the carpet will match up to the overall theme of your home. Consider a higher grade carpet for households that are going to have a lot of foot traffic, or for those that have animals such as cats and dogs. Spend a little more money on stain-resistant carpets. These carpets are easier to clean when the stains are present. These are ideal for those that have children. When browsing carpet samples, look at the back and see what kind of fiber the company use and what kind of warranty they include. If the fiber count is listed, you will look for a higher number because these strands reflect the carpet’s durability. These specifications will help you determine how good the carpet will be. A durable type of carpet that doesn’t leave behind footprints of vacuum marks. Built with a thicker yarn, Berber is designed for higher trafficked areas. The smaller loops inside of the carpet can often hold more dirt. Known as the best selling carpet, a cut pile type bundles standing straight out. Creating a high-class appearance, this type of carpet doesn’t “crush” as much as other carpets. Tightly twisted carpet, this type is great for high-trafficked areas. Created with tight fibers, these fibers tend to curl. 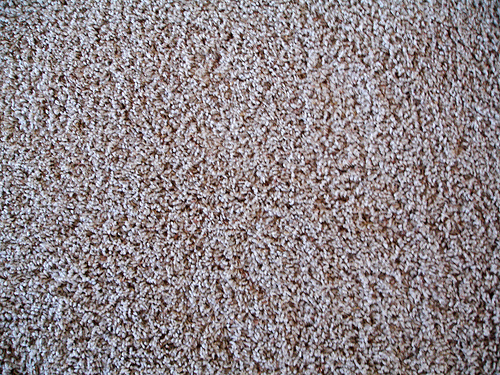 Tightly twisted carpet, this type of carpet will consist of at least two different fibers. With a softer feel, this type of carpet will show all vacuum mark and footprints. Commonly found in children’s rooms and living areas, this type of carpet is tightly twisted and has great durability. With its look, it can easily hide footprints and marks. Softer than most carpets on the market, velvet carpets are ideal for bedrooms and living rooms. Showing every footprint, this tends to be a luxurious carpet for homes. This has a spongy feel and is resistant to most stains and mildew. It’s easy to clean and is also fade resistant. Very soft and has a similar feel to garments made from cotton. This type of carpet can stain easily and is not ideal for homes with children and pets. This is used in more than 65 percent of the carpets sold in the United States. This is notably the strongest type of carpet material since it’s considered durable and resistant to mold. Also resistant to mold and mildew, and it is known for its color patterns. Known as another common material uses, polypropylene is incredible stain-resistant and resists fading. This is a premium material that’s known for its deep and luxurious feel. Doing some of the work yourself can save some money. Ripping out your old carpet and padding and disposing of it can save you money with some companies. Moving your own furniture can also lower the cost. Hiring a private installer may be cheaper than having the company from which you bought the carpet also install it. Try to clean your carpets at least once a year. Whether you do it yourself or professionally, this can help prolong your carpets. By avoiding a cleaning, carpets will tend to wear away faster than others. When comparing prices, be sure to ask what all is included in the “per square foot” or “per square yard” price that is advertised. Big box retailers like Home Depot and Lowes will offer a free estimate and even measurement during some sales.